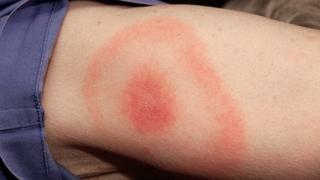 Lyme disease can be diagnosed by the rash alone, new advice for the NHS says. People with the “bull’s eye” circular rash do not need a blood test and should be treated immediately to avoid complications, the National Institute for Health and Care Excellence says. Waiting for lab results is unnecessary and can cause delays in patients being prescribed the antibiotics they need. Lyme disease is spread by tick bites and can be debilitating. A blood tests can check for it but may not give a positive result until eight weeks after the patient is bitten. Prof Gillian Leng, deputy chief executive and director of health and social care at the National Institute for Health and Care Excellence (NICE), said for most people with Lyme disease, a course of antibiotics would be an effective treatment, “so it is important we diagnose and treat people as soon as possible”. “A person with Lyme disease may present with a wide range of symptoms, so we have clear advice for professionals about the use of lab tests for diagnosis and the most appropriate antibiotic treatments,” she said. Lyme disease can be difficult to diagnose. It has similar symptoms to other conditions and there is not always an obvious rash. The rash can also appear in a number of different ways, as these images from the NICE guidance show. A growing number of high profile people have spoken out about their experiences of the problems of living with Lyme disease due to delayed diagnosis. American model Bella Hadid has spoken of the challenges of continuing to work with the disease because she’s often exhausted and needs to take regular medication. Her mother, who starred in The Real Housewives of Beverly Hills, and Bella’s brother also have the disease. Singer Avril Lavigne said it had taken months for her to be diagnosed with the disease, which had left her bedridden for two years. She got the first symptoms on tour, when she was achy, fatigued and couldn’t get out of bed. She said she had felt so bad at one point she had “accepted that I was dying”. Former England rugby player Matt Dawson got the disease after being bitten by a tick in a London park in 2015. It caused a bacterial infection to spread through his body and eventually left him needing heart surgery. Phones 4U founder John Caudwell funds a charity Caudwell LymeCo that funds research he hopes “will lead to a truly reliable test and cure via the NHS for every Lyme disease patient”. He and 14 other members of his family have the disease. Veronica Hughes, chief executive of Caudwell LymeCo, said she hoped the new NICE draft guidance would increase the number of doctors who felt confident diagnosing a Lyme disease rash on sight. “Caudwell LymeCo Charity hears regularly from people whose doctors have diagnosed an erythema migrans but decide to check with a blood test, not realising that the rash is the more reliable of the two,” she said.